Soulsville needs more organic development, a reinforced neighborhood identity, better wayfinding signs, and maybe a coffee shop, according to members of an Urban Land Institute (ULI) technical advisory panel. Members of the panel — a mix of architects, artists, development professionals, and Soulsville residents — discussed these recommendations and others at a public meeting Tuesday afternoon at the Stax Academy. The group found that Soulsville lacks neighborhood connectivity, especially between the Stax Museum and LeMoyne-Owen College, and has too many vacant spaces in between existing businesses. Brian Whaley with CBRE led the presentation, and he said some of those blighted or vacant spaces should be activated with community gardens, mini parks, or other uses. He also said the black windows at Stax, although there for historical reasons, made the museum seem uninviting from the sidewalk. Missing from Soulsville are healthcare facilities, eateries, pocket parks, public gardens, live music venues, and fitness facilities, according to the ULI presentation. "Tourists come here for Stax, and they want to eat. But they end up leaving the neighborhood to eat," Whaley said. The ULI panel interviewed Soulsville neighborhood stakeholders, and they said Soulsville should focus on offering places where the next generation could connect to the neighborhood. They also wanted a coffee shop, an ice cream shop, and a place where neighbors could interact. Accessibility and walkability were also high on the list of stakeholder needs. The design recommendations from ULI suggested new wayfinding signs directing tourists to various points around Soulsville, a Soulsville sign on the bridge over I-40, visual transparency into the Soulsville gift shop, and signage explaining Stax's black windows (which were actually never explained in the ULI meeting). They also envision a sculptural seating area at the rock garden being built by the I Heart Soulsville mural, more community gardens on empty lots, more affordable housing, and having artists paint abandoned structures. Better connections between the Soulsville bike lanes and downtown bike lanes were also mentioned. Retail recommendations included a record shop, a music store offering lessons, and a coffee shop/bookstore. 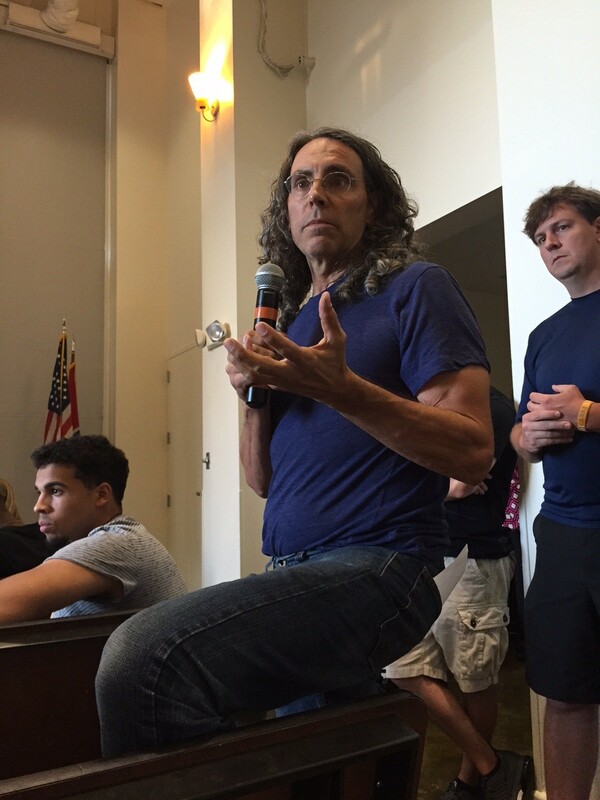 At the end of the meeting, film director Tom Shadyac, who recently purchased the foreclosed Towne Center in Soulsville at an auction, stood up to address the audience. He said he has plans to build a restaurant with a pay what you can model. And he plans to turn Towne Center into a spiritual healing center that will help heal people through meals, art, and mentorship — a sort of St. Jude for spiritual needs. "We feel there is something moving here. There is a spirit here. I think it's called Soulsville for a reason," Shadyac said. "There are no limits to the soul. And there are no limits to what we want to do in Soulsville."